F is for FREE! Our Question of the Month Giveaway is here! You will have the chance of winning this amazing prize package valued at US$55. The package includes: An 8 Piece Satina Professional Cosmetic Brush Set, a set of embellished pins, and Brushlab Round Brush. 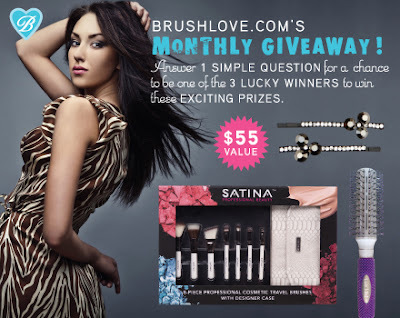 To enter simply visit Brushlove.com and check for the freebie that we are offering with every US$25 purchase. Once you find it write down your answer on the Giveaway Tools Box Below. This contest is open for USA and Canada residents only. We have partnered with these awesome bloggers to offer you extra entries: Coupon Cousins, So Sew Mama, Everything Mommy Hood and Baby Cost-Cutters.